The changes to Route 25, 34 and 40 are intended to introduce new service areas and separate higher ridership, faster arterial service from lower ridership less direct neighbourhood service. In the changes, Route 25 is proposed to stay on Fanshawe Park Road between Phillbrook and Trossacks. 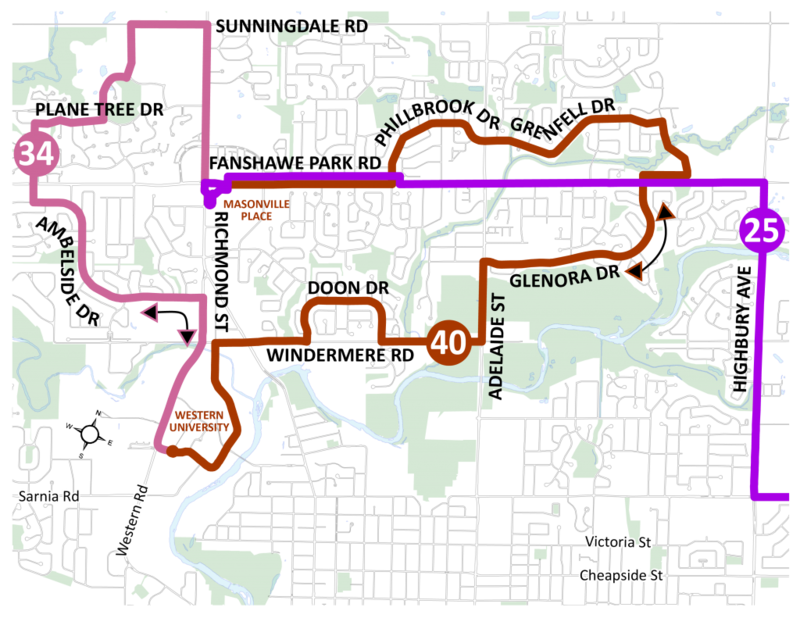 Route 40 would be modified to provide neighbourhood service to Doon, Grenfell and Northridge. Route 40 would have two-way service to both Masonville Mall and Western University. Route 34 would be interlined with Route 40 at the University during all time periods. To provide service to the Plane Tree area, Route 34 would be extended north to Sunningdale. The routing modification for Route 34 provides service for a large, rapidly developing area that is increasingly requesting service. The Route 34 extension would provide one-bus service to Masonville Place and Western University. The separation of neighbourhood and arterial service better aligns service with demand and creates efficiency by creating faster run-times for more passngers. These efficiencies enable further service investment in areas of need. Route 25 is in particular need of investment as it has experienced rapid ridership growth since its extension to Masonville in the Fall of 2017. There have been overcrowding concerns on weekday afternoons and the ridership on Sunday justifies more frequent service than the current 60 minutes. Route 25 is proposed to have frequency improvements on weekdays from 2-5pm from 30 minutes to 20 minutes and on Sundays from 3-7pm from 60 minutes to 27 minutes. Service reliability has also been an issue on the Route, which would be addressed through the routing modification. Passengers on Route 25 that currently travel through the Phillbrook/ Grenfell neighbourhood will benefit from the route operating more directly on Fanshawe Park Road. Passengers would see decreased service in the Grenfell/Phillbrook and Doon/Windermere areas. In both areas, service during daytime periods would be reduced from 30 minutes to 45 minutes. The impact to Grenfell/ Phillbrook passengers travelling east would now require a transfer or a long walk to the more direct Route 25. There are three areas that will see significantly improved service. 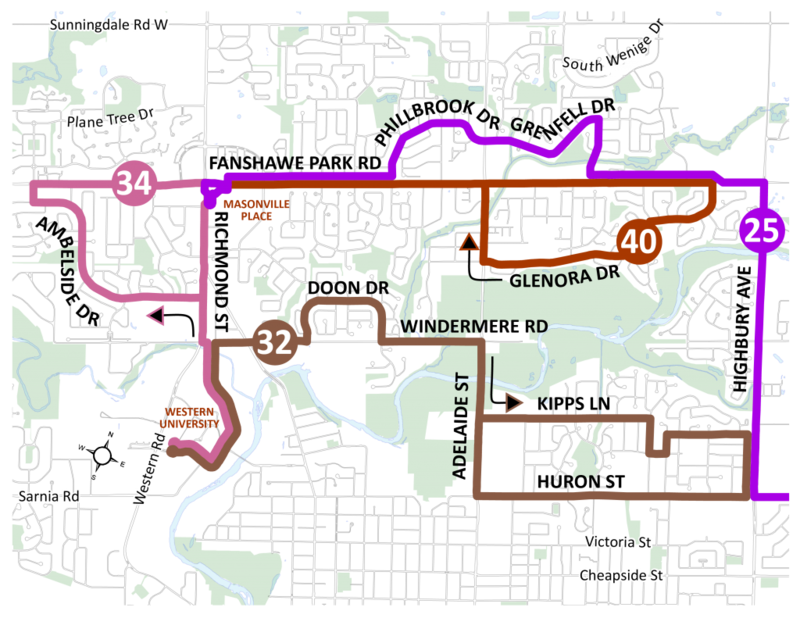 The Northridge neighbourhood currently served by Route 40, Ambleside currently served by Route 34, and the currently unserviced area of Plane Tree and Richmond and Sunningdale will all see two-way service connecting to Masonville Place and Western University.